Девид Боуи (ингл. David Bowie [ˈboʊ.i]; ысын исеме Дэ́вид Ро́берт Джонс (ингл. David Robert Jones), 8 ғинуар 1947—10 ғинуар 2016) — Бөйөк Британия рок йырсыһы, йырҙар авторы һәм шулай уҡ продюсер, звукорежиссёр, рәссам һәм актёр. ↑ (not translated to en-gb) David Bowie obituary — The Guardian, 2016. ↑ Pareles, John. Review/Rock; For Bowie, One More Change of Pace, The New York Times (30 November 1991). 2 ноябрь 2008 тикшерелгән. 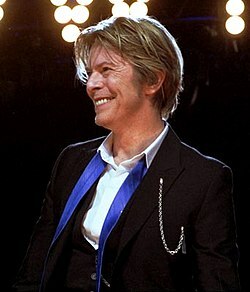 ↑ How to say: Bowie. Magazine Monitor. BBC News (8 January 2008). Тәүге сығанаҡтан архивланған 26 август 2011. 22 ноябрь 2008 тикшерелгән. Buckley, David Strange Fascination — David Bowie: The Definitive Story — London: Virgin, 2000. — ISBN 075350457X. Charles Shaar Murray, Roy Carr, Bowie: An Illustrated Record — New York: Avon, 1981. — ISBN 0380779668. Pegg, Nicholas The Complete David Bowie — London: Reynolds & Hearn, 2004. — ISBN 1903111730. Был бит һуңғы тапҡыр 12:19 15 март 2016 үҙгәртелгән.